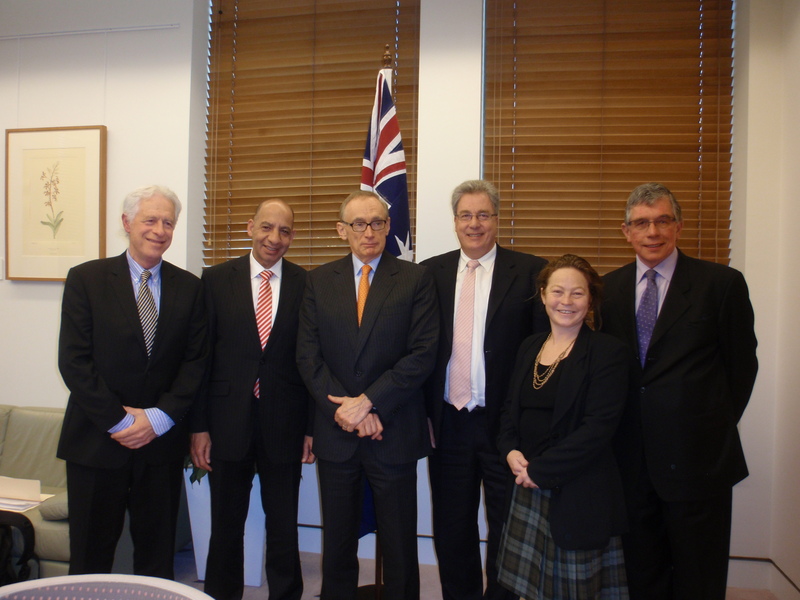 Concerned about the ongoing pandering to Israel from both major parties, APAN went to Canberra with two key messages. The first was that as an ally of Israel, it is in Australia’s national interest to raise concerns about Israel’s behaviour, both in regard to its apparent intransience in negotiating a final solution, as well as its current behaviour in the meantime (the blockade of Gaza, ongoing settlement construction, extreme use of administrative detention). Jessica Morrison, Jeff Hart, Russell Broadbent MP, Rev Jim Barr. We argued that countries like Australia should be formulating policies designed to help those individuals and groups within Israel working for change. By acquiescing in Israel’s illegal actions, Australia is turning its back on those in Israel who most deserve our help – Israelis who say no to the extremist and ultimately self-defeating policies of a government that has turned its back on peace. Our second message was that the mantra of “getting both sides back to the table”, used consistently in Australian politics is deeply problematic. It fails to recognise the gross power differential between the sides. We argued that Australia must unilaterally recognise Palestinian statehood, and work multilaterally so Palestine isn’t asked to negotiate alone with her occupier. We met with the Foreign Minister and found him receptive and well aware of the issues . We argued that Australia should follow the lead of its European counterparts by naming the Israeli settlements as illegal, and the inequities of the so called ‘bargaining table’. We also met with other politicians across the Parliament. We also held an event with the Parliamentary Friends of Palestine, where Avigail Abarbanel and Assoc Prof Peter Slezak were able to talk about the book Beyond Tribal Loyalties, and what it means for them as Jewish people to raise deep concerns about Israel’s behaviour. We were encouraged by the range of politicians who expressed interest and concern for Palestinians. However we were also reminded that it remains politically unpopular to raise concerns about Palestinian human rights and the breaches of international law. We are deeply grateful for the few politicians who will speak in support of Palestine. We hope that the ongoing work of APAN and other groups around the country will help move Australia to a more balanced perspective.